Welcome to another (late) edition of NTT (please forgive me!). I swear, my days have all been running together lately! I'm slightly embarrassed to say that I haven't made any further progress on my Stacked Squares quilt since Sunday, so let's just jump right into last weeks highlights! I know I've said it before, but really- picking just three projects to feature is so darn tough! 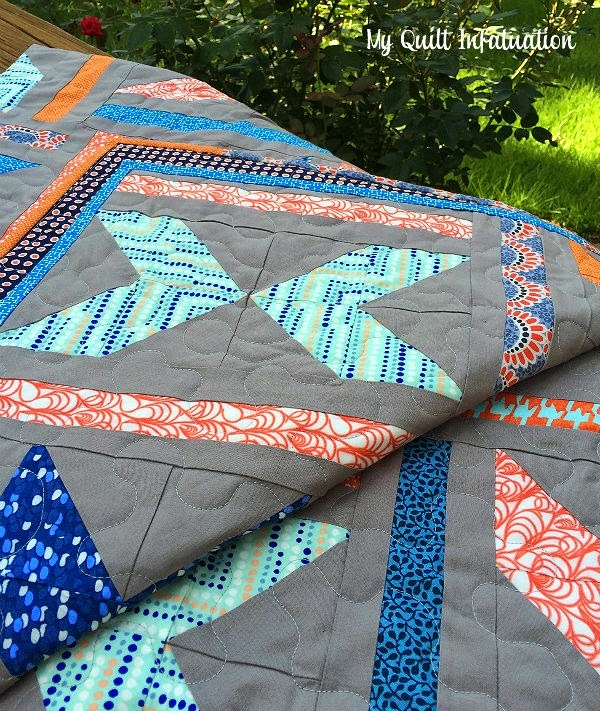 Hilary from Young Texan Mama showed off her Texas Road Trip quilt and it is a beauty with those AMH fabrics! 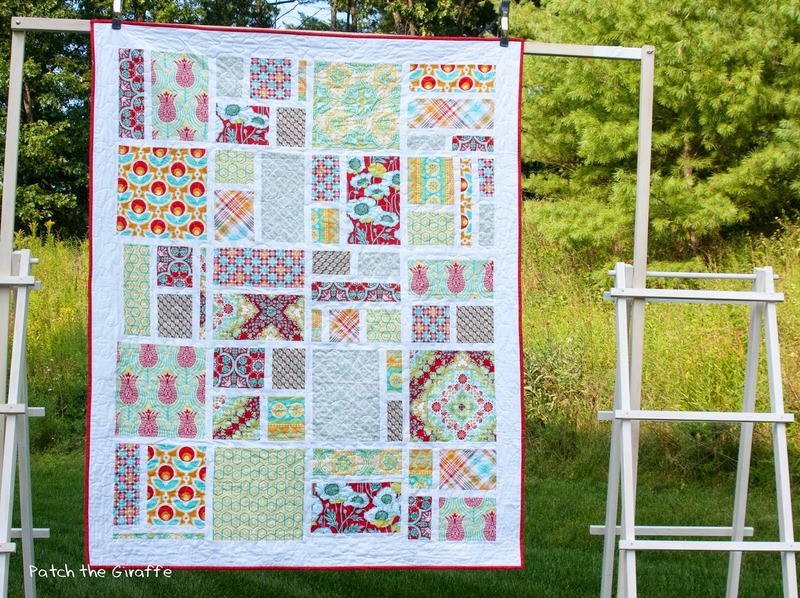 This Notting Hill quilt from Patch the Giraffe is so fresh and airy. I just love it! 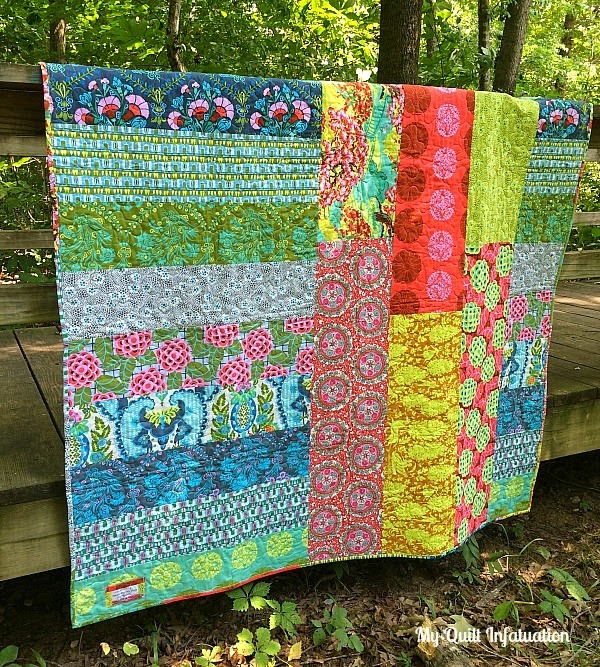 and Paula, The Sassy Quilter linked up her TWO color variations of the Jelly Roll Jam pattern. Super cute! **Please remember to be sure your post includes a project. 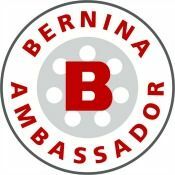 I would appreciate it if you would not link to giveaways or other parties unless your post also includes a project you're working on. I have been in love with the illusion of the Stacked Squares quilt pattern for awhile now, and I've finally gotten around to making my very own. Although I have loved the pattern, it is written using a layer cake and two jelly rolls. I don't know why, but that seemed like a lot of fabric for a throw sized quilt. Using precuts is certainly easy, and patterns for them are often written to judiciously use up every bit of fabric, but not always. Since this pattern only uses 23 of the layer cake squares, and of course, since I didn't have a layer cake and two jelly rolls of a single fabric line on hand, I decided to make some modifications to the pattern to make it work for my stash. 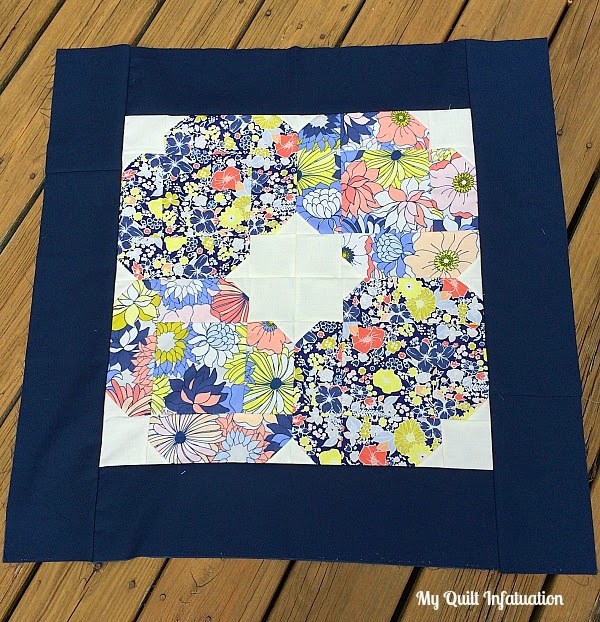 I have had a FQ bundle of Garden Party Tango (with a few other fabrics from stash) that was just begging to be used in this pattern, but figuring out how to make it work was a challenge. 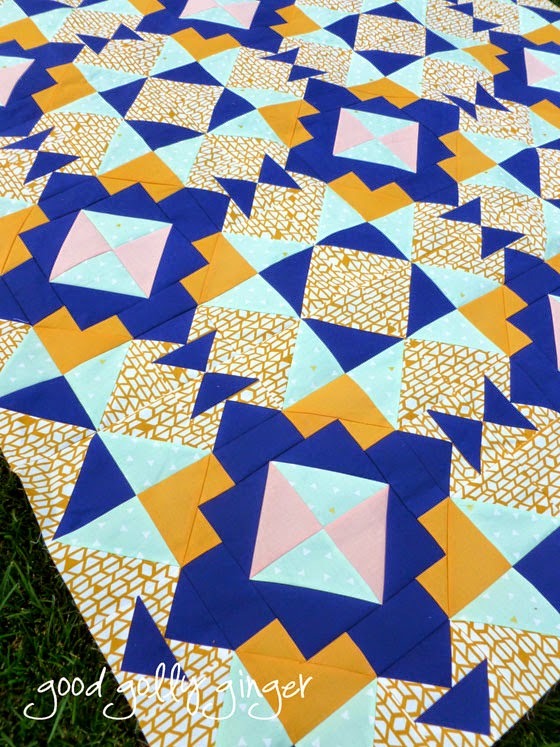 The biggest difference in my Stacked Squares quilt and the Moda Bakeshop pattern is that my center squares are only 8 inches finished, making my finished blocks 16 inches. 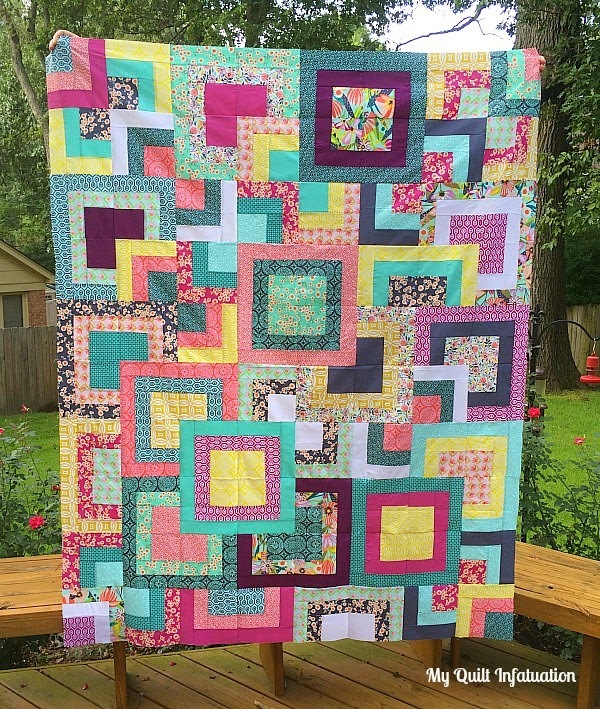 This makes it possible to make the quilt from 23 fat quarters (or quarter yards) and I don't think it detracts from the illusion of the pattern at all. 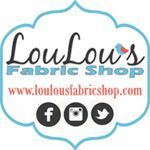 **Make sure you have enough width in your fabric. Some bolts are a little shorter, but I have used plenty that are wide enough. You are cutting one complete block from each fabric. So, after you mix up the fabrics in a way that is pleasing to you, you will have 23 complete blocks, each with three contrasting fabrics. 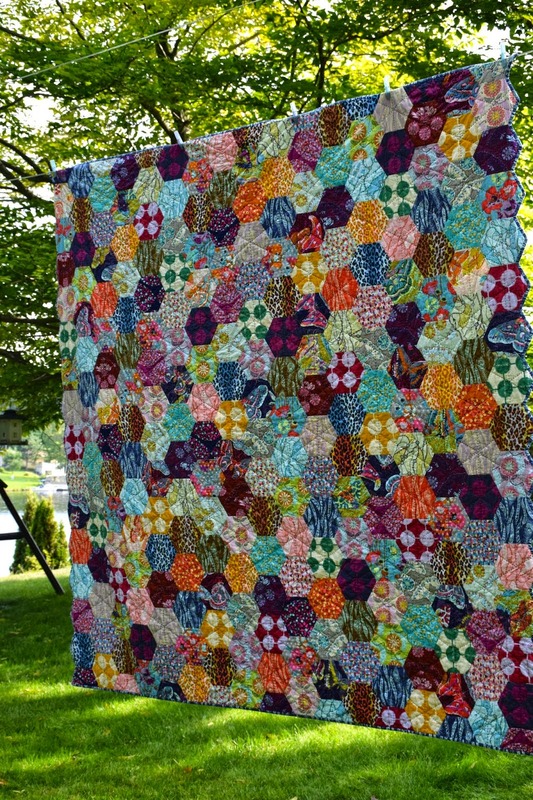 Even though the quilt technically only has 20 blocks, you will need all 23 to make all of the "partial" squares work. My finished quilt top measures 64" x 80" (a twin size!) which is actually a little bigger than the Moda Bakeshop pattern. Pretty cool, considering that I downsized the center squares! 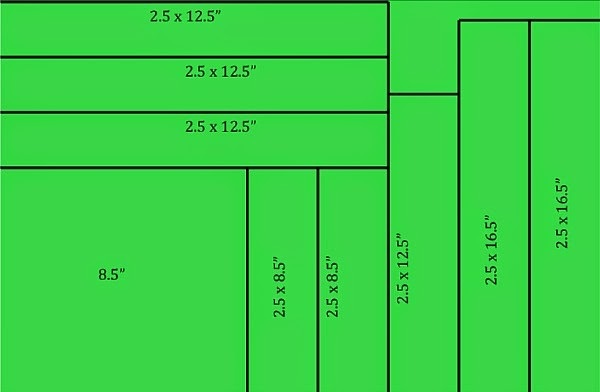 Let me know if you decide to try this pattern out with these measurements with your own stash! The craziness of the beginning of school strikes again! Sorry NTT is a little later than usual. I know it's still not quite Thursday, but I usually like to get this post out earlier in the evening. I don't have any news since my big reveal yesterday, so let's jump right into last weeks awesome highlights! 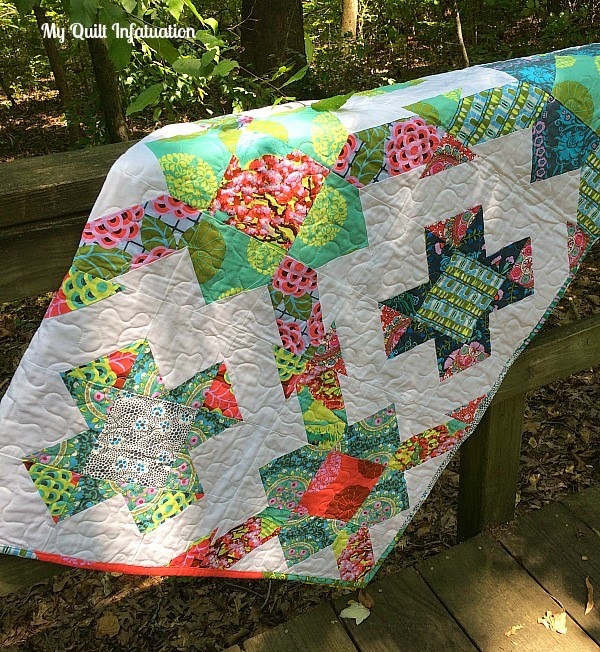 I first showed this gorgeous quilt from Maryse Makes Things when the top was finished, and now that it is completely finished, I just can't help showing it again. 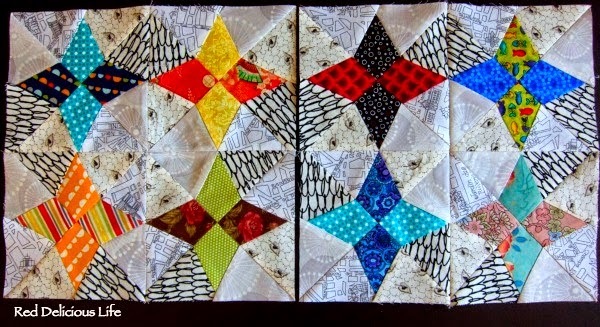 Diana at Red Delicious Life linked up these great blocks. I love the brights agains those great background fabrics! 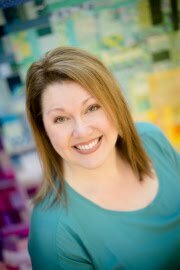 and Karin at Leigh Laurel Studios showed off this beauty! Okay, y'all, time to show me what you've got! Hooray! 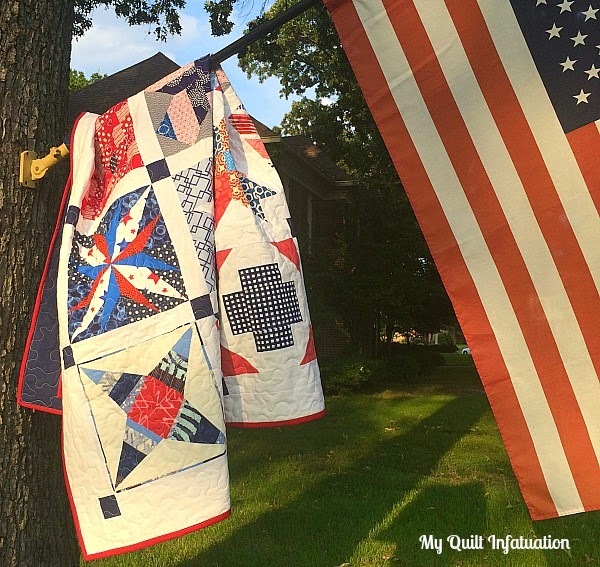 I finally got my quilt back from the publisher of Modern Quilts Unlimited magazine. Well, okay, I actually got it back a little over a week ago, but this weekend, the weather finally cooperated with beautiful weather for a proper photo shoot. 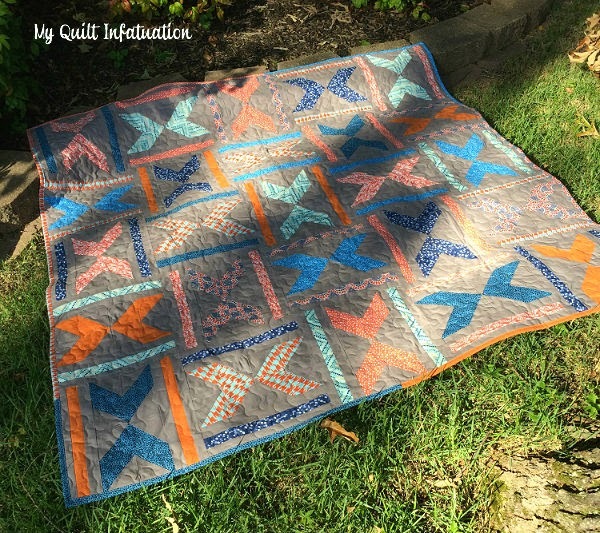 I really loved the whole process of making this quilt- from the design, to making the quilt, to the pattern writing. 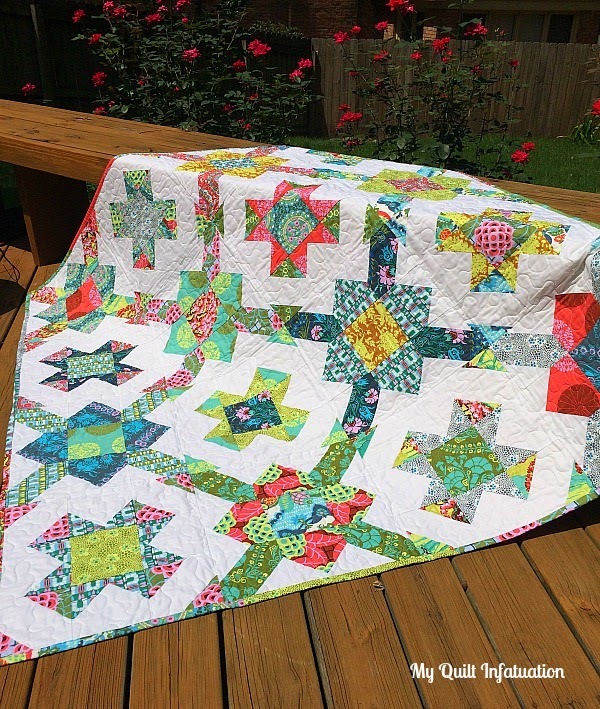 In fact, the pattern for this quilt was my very first! 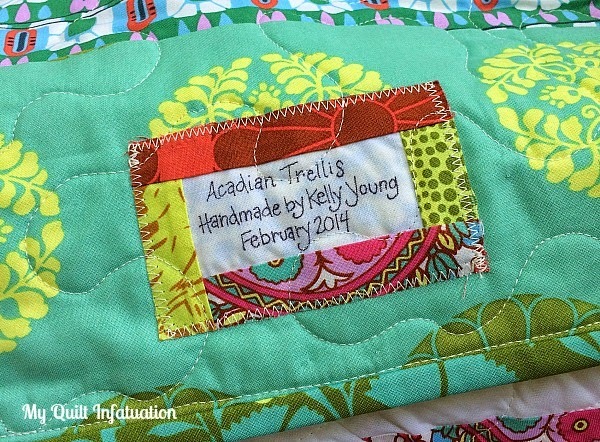 I decided to name this quilt Acadian Trellis. Acadiana is Louisiana's Cajun Country, and I thought this name was fitting because the vibrant colors against the lush green remind me of the summery colors of the gardens in my home state. I used Amy Butler's Cameo collection in this quilt, and I just couldn't get enough of it (y'all know I'm an Amy Butler fanatic), so I decided to piece the backing with wide stripes of the same collection. And, even more Cameo in the scrappy binding! I have to say that out of all of the quilts I've ever made, this one is certainly near the top of the list in terms of pride. 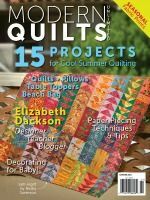 If you want to check out the pattern, you can pick up a copy of the current issue of MQU magazine! I'm so excited that I get to share a quilt finish that has been months in the making, and has involved the efforts of several awesome ladies. 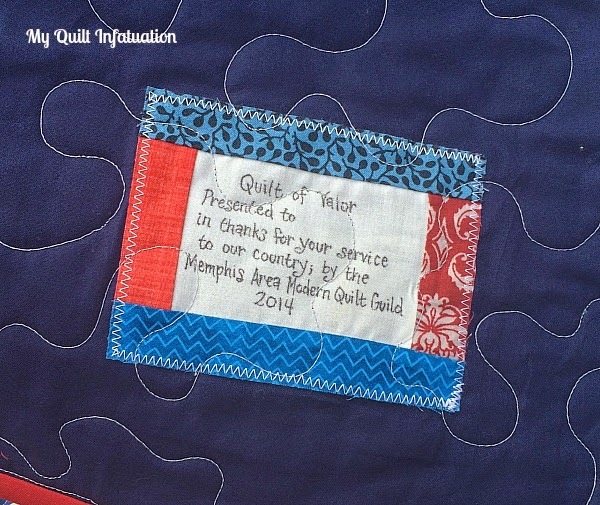 The members of my quilt guild (the Memphis Area Modern Quilt Guild) decided to channel our charitable quilting efforts into a couple of different areas this year. One was that we made the decision to work together to make a Quilt of Valor, and I could not be prouder of the end result. We are a very new guild, and very small (around ten members- but trying to grow! ), but though we are few, we are very dedicated modern quilters. 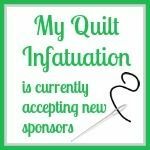 We have wide variety of experience levels, and our guild members include several other bloggers that you probably know as well- Janet from Simply Pieced, Katelyn from Sing While Crafting, and Lori from Crossquilt. 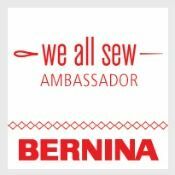 Since we are so small and all have super busy lives outside of quilting, we wanted to be sure that we didn't bite off more than we could chew with a charity project. We decided to work together to make a sampler quilt to accommodate everyone's fabric stash, sewing preferences, and experience levels. We all agreed to use Kona White as our background (if any) so that the blocks had some continuity, and we divided up the quilting jobs as well. We all contributed blocks, and Katelyn assembled the quilt top. Janet put the backing together, and she and I basted it. Then I quilted and bound it. I just LOVE how it turned out! 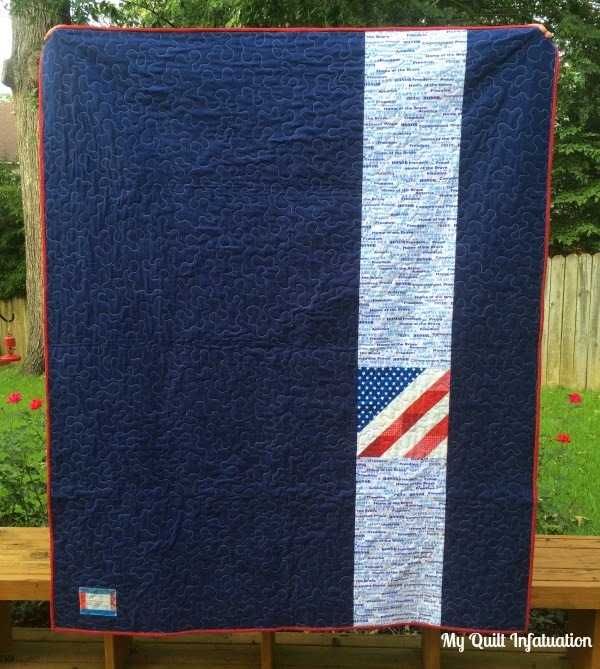 The backing is Kona Navy with a fantastic patriotic text print, along with one orphan block. Incidentally, this may be my favorite block in the entire quilt- but it is so hard to choose just one! I quilted with white on the front and gray thread on the back so that it blended in just a little bit better with the dark backing. 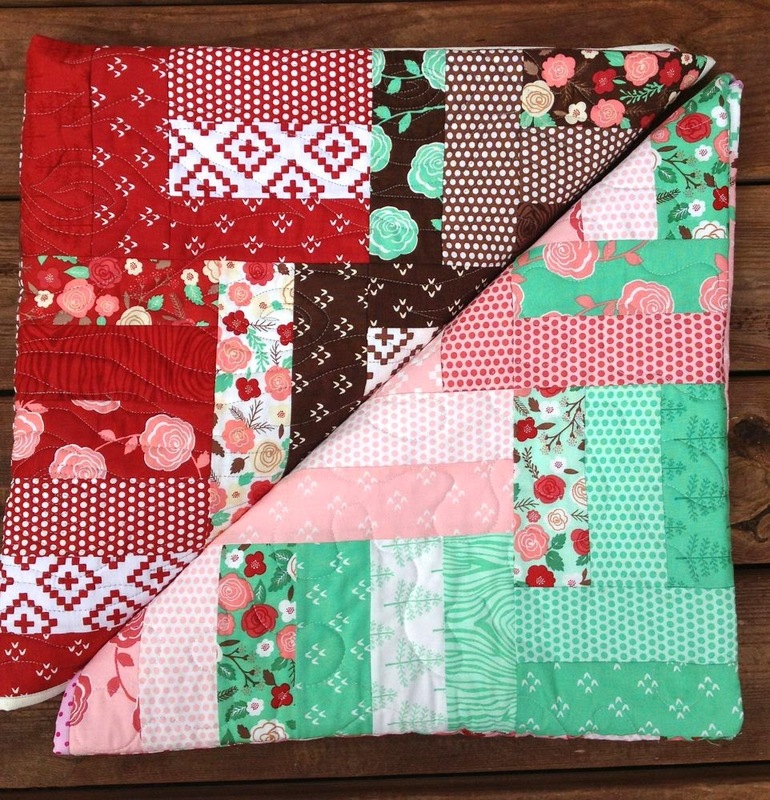 The binding is Kona Rich Red, and frames the whole quilt beautifully. I used my own labeling method, and left space to write in the recipient's name. By the way, even though it looks crooked in this picture, I promise the writing is straight. Just a funny camera angle, I guess. I hope that the serviceman who receives it can feel the appreciation we have for him (or her!) in every single stitch. Welcome to Needle and Thread Thursday! I was finally able to carve some time out of my busy schedule this weekend to finish up my Slingshot quilt! Just a little aside- I've been having wifi connection issues, and my regular fonts wouldn't load in my photo editor, so my watermark is slightly different on my photos. Incidentally, this is also the reason why my NTT post is a little late today! I must say that it felt so nice to get this one finished. I hadn't actually finished a quilt since Shattered Rainbow before my sister's wedding in July, and my life just felt wrong! There is something about the blue, orange, and gray color combo that I really love. It's so fun and boyish, but a little bit grown-up. 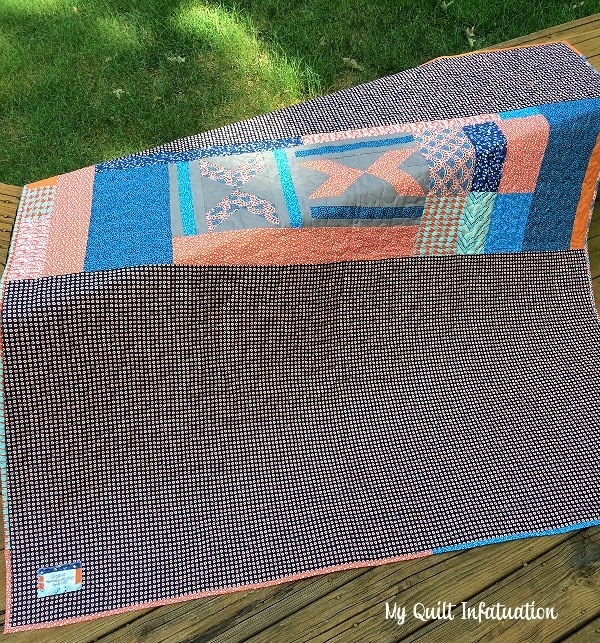 I used all of my scraps in the backing and paired it with that awesome Denyse Schmidt navy and orange dot fabric. 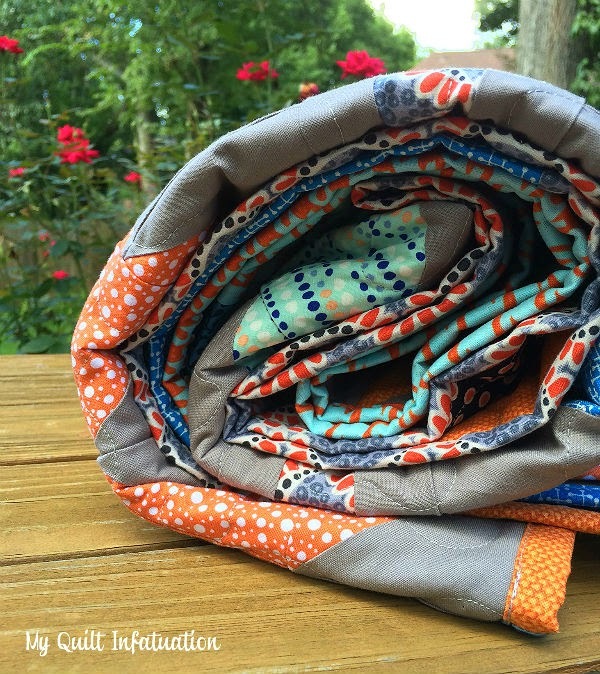 I used this same fabric to bind my Dash of Luck quilt, and have always loved it. When I saw that my local shop managed to find a bolt of it, I snagged some yardage pronto. I really like the way the blue and orange fabrics pop against the Kona Pewter background. Even though I usually go for a lighter background fabric, I'm really happy with this choice. I also love the look of the scrappy binding against it. I actually had quite a productive sewing weekend last weekend, and have plenty more to show you, but for now, let's just get on to the highlights from last week's party! 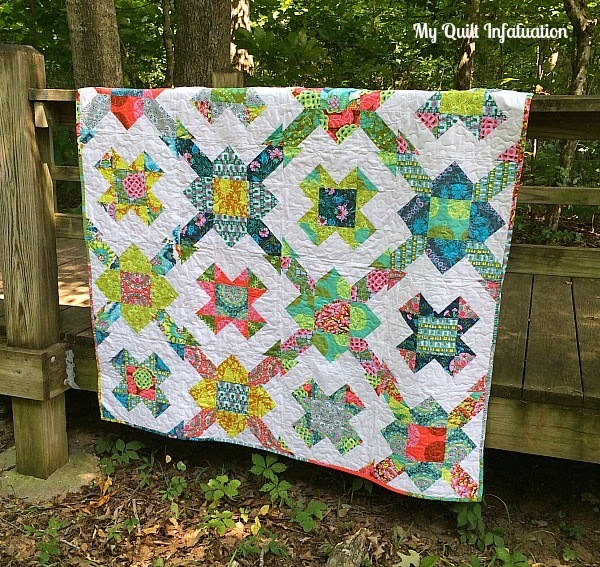 I featured the block for this quilt several weeks ago, by Good Golly Ginger, and now that the whole quilt is finished, I love it even more! 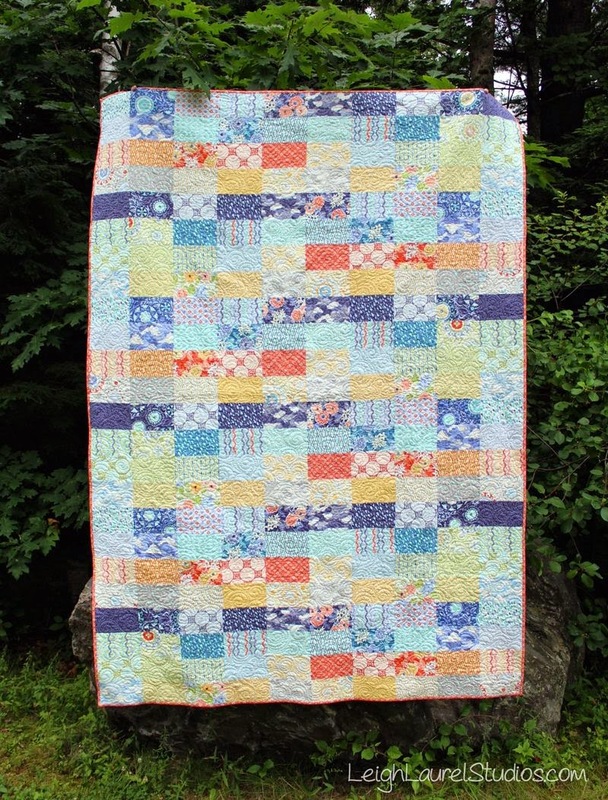 Tanya Quilts in CO linked up this gorgeous rainbow orange peel quilt. I am such a sucker for a rainbow quilt! 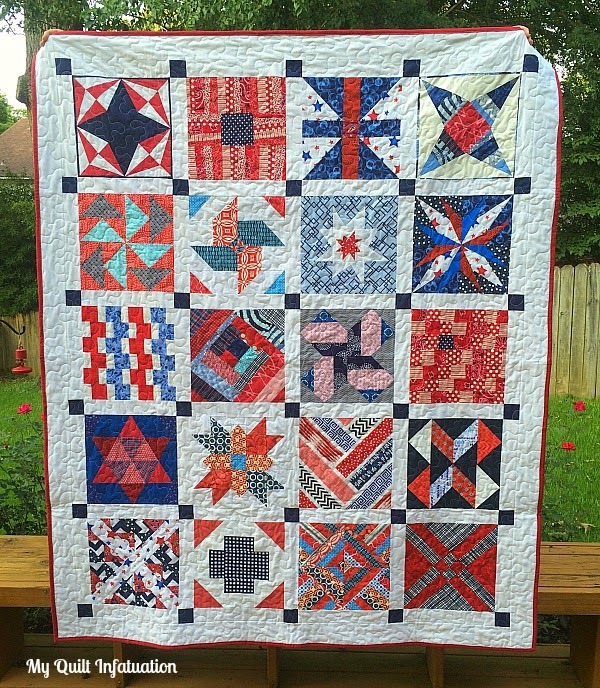 and last, but not least, Carol Quilts Sometimes linked up this Summer Sampler beauty. 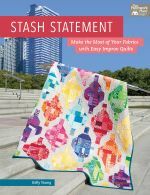 I have to tell you, with the craziness of starting school in general, not to mention moving to an entirely new grade, I have especially enjoyed browsing through all of the quilty goodness. I almost always look through the party links while in bed, right before turning in for the night, and even though the time has been shorter than I would prefer, I have so appreciated those few minutes of creative joy each night. So, thanks...and I am truly looking forward to checking out what you all have going on this week! Time keeps getting away from me, doesn't it? I didn't get the chance to close out the giveaway yesterday, and truthfully, I don't know what I was thinking by planning to write a post on the Friday following the first week of school. All I could do last night was collapse! 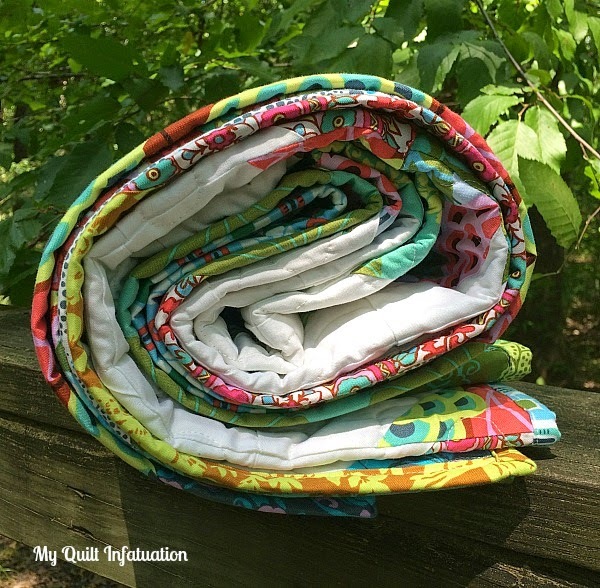 Anyway, it was so much fun to see all of the comments with your favorite pattern from Fat Quarter Style- 116 of them! Mr. Random Number Generator picked lucky comment number 28. Congratulations, Kate! I'll be contacting you soon so you can check out Raindrops, as well as the other awesome patterns in the book! 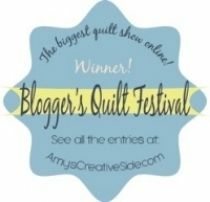 Fat Quarter Style, NTT (Early), and a Giveaway! First off, let me apologize for completely forgetting Needle and Thread Thursday last week. I was so busy that I didn't even realize I forgot to publish it until Saturday morning. Believe me when I tell you that these last couple of weeks have been a whirlwind. As you know, teachers here started back to school last week, and students started this past Monday. Personally, I think it should be a crime for anyone to go back during the month of July, but nobody asks my opinion on these matters. ;) Well, after looking at school test scores, my principal decided to move me from 3rd grade to 5th, teaching Language Arts since I am a Reading Specialist. Of course that meant a 60 hour work week last week to move all of my things and prepare. I have to give a huge shout out to my hubby for taking off a couple of days of work to help me out! So, all of that is to say that I'm sorry to have missed the party last week! 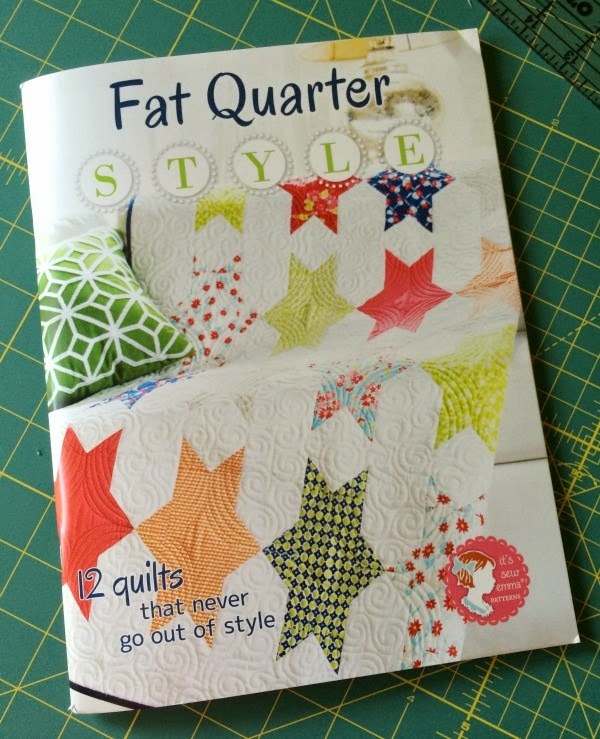 Even though students started school on Monday and I'm still super-busy, today is my stop on the Fat Quarter Shop's blog book tour for their newest book, Fat Quarter Style. This books is chock-full of fun, modern patterns, and I can't wait to get a little more time to really make some of them. I made a single block of the Tapestry pattern, and it is so lovely! The block is 20.5 inches, so it has a really bold look. I'm planning to add another border to this one and turn it into a preemie donation quilt. I'm so excited to let you know that I have a second copy of Fat Quarter Style to give away to a very lucky reader! 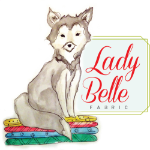 To enter the giveaway, just check out the Table of Contents of the book HERE and let me know which pattern in the book is your favorite. I'll announce the winner on Friday afternoon! Since I wanted to make sure that everyone had a chance to enter the giveaway, I decided to go ahead and post NTT early this week! So, let's get to Needle and Thread Thursday, shall we?